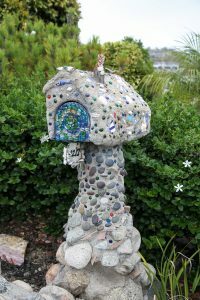 From house replicas to creative sculptures, Laguna mailboxes transcend the traditional. In this artsy town, even the mailboxes are masterpieces: Animal shapes from fish to cows, near perfect house replicas and impressive sculptures dot the streets, waiting for each day’s letters and packages to arrive. 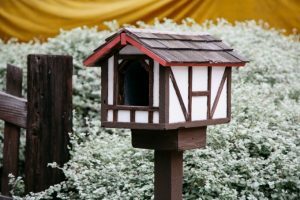 Some of the mailboxes that resemble little homes are like dioramas complete with figurines and elaborate landscaping similar to model train scenery. 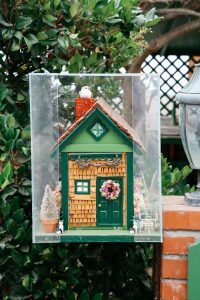 Many of these charming boxes were handmade by the homeowners, lovingly maintained through the years, bringing smiles to the faces of passersby. Often, a mailbox’s aesthetic matches the residence style—quaint creations paired with historic cottages, modern designs for contemporary abodes, sealife-inspired options for beachside bungalows. The imagination knows no bounds when it comes to these front yard conversation starters. 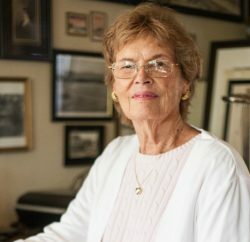 Helen Shirley, a postal carrier for 26 years—including the last decade in Laguna Beach—is quite familiar with this city’s mailboxes, which are anything but typical. 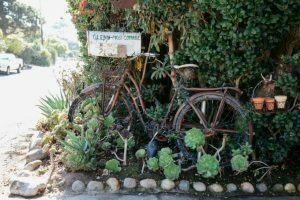 In north Laguna, she says, some homes have baskets hanging in the trees that serve as receptacles for letters delivered there. In other neighborhoods, the postal contraptions have left Shirley scratching her head in befuddlement, like one puzzling house replica on Catalina Street. “When I first delivered there, it took me like three days to figure out how to open it,” she says. Shirley recalls another that was built into a hedge, hidden from sight. 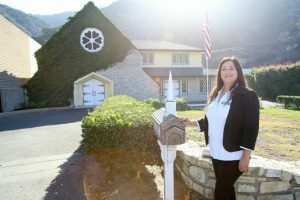 “Delivering mail in Laguna is like being on a scavenger hunt because sometimes you have to seek and figure out how to open the mailboxes,” she says. Indeed, from the unique to the thought-provoking and slightly puzzling, these works of art deserve a closer look—and many have a story to tell. Once a discarded tchotchke, this Ruby Street mailbox is now a charming, tiny house. On Ruby Street, attached to a picket fence, a mailbox that looks like a tiny house with a red door and wooden roof was once a discarded tchotchke that received new life at the home of Judi Patterson. “I found it in Orange on the street, left over from a garage sale,” Patterson says. She picked it up and brought it home, where she painted it, covered it with seashells and added a bird on it. Patterson loves a good find and decorates her 1938 cottage with repurposed items, changing the decor all the time. “I’m a flea market person,” she says. “I don’t think there’s a thing in my house that’s not from a flea market.” For 24 years, Patterson has lived in the 900-square-foot home, a quaint structure that needed a mailbox to match. “It wouldn’t be fun not to have a cute mailbox,” she says. 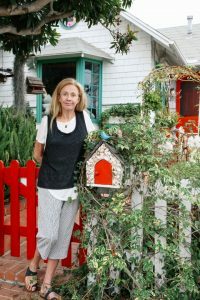 During the Laguna Beach Plein Air Painting Invitational, she says artists have come by and painted pictures of her house and mailbox (whose little red door mimics the bright color on her own home’s door and front gate). It’s a charming scene that’s quintessential Laguna. On Glenneyre Street, a 1960s cruiser bicycle holds a standard metal mailbox to create a one-of-a-kind postal landmark. An English Tudor-style mailbox resembles that of the full-size residence it stands before on Catalina Street. An English Tudor-style house stands on Catalina Street with a replica home serving as the mailbox out front. The design resembles that of the full-size residence with its wood-shingled roof and decorative “half-timbering,” a kind of exposed wood framework over white stucco walls. “It’s been here probably since the ’50s,” says owner Madeline McLendon, who inherited the mailbox when she bought the house 46 years ago. “It’s a cute idea to do that,” McLendon says of the alternative box. She takes care of it, repainting and replacing the little shingles on top as pesky termites eat away at the wood. “I keep repairing it because I will always love it,” she says. This Glenneyre Street box is extremely detailed, and protected by a fiberglass cover. At Laguna Canyon Road’s McCormick & Son mortuary, a miniature chapel replica provides a bit of much-needed cheer. Homes aren’t the only structures with intricate mailboxes. Some businesses, too, have a little fun with this common item. On Laguna Canyon Road, McCormick and Son’s mailbox is a model of the mortuary’s chapel, but with a taller steeple. Plastic windows even resemble stained glass. Crematory manager Rebecca McCormick says the mailbox was crafted by her father, Robert McCormick Jr., who died about three years ago. The family business has been located in the canyon for more than 40 years and Rebecca’s father built the mailbox about 25 to 30 years ago. It’s occasionally been hit or knocked down by passing motorists, so Rebecca has refurbished it and stuck it back on the post. As a funeral home, she says the mailbox offers a small bright spot at a business that’s somber by nature as they help families during a time of grieving. “Being a mortuary, there’s not a lot of fun, fancy things we get to have,” she says. “… You find it in the little things,” she says of the mailbox that might bring a smile to someone’s face for even a brief moment. This stainless steel mailbox on Canyon Acres Drive is a work of contemporary art. 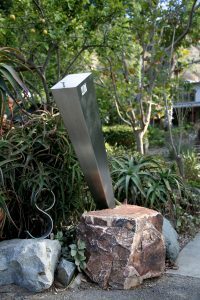 Frank Smart, a former Festival of Arts exhibitor, makes contemporary, stainless steel mailboxes in addition to his other metal work such as gates, light fixtures and furniture. 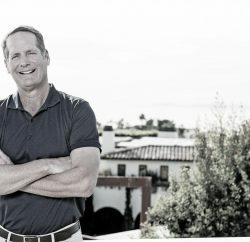 A Laguna resident since 1987, Smart moved here from Scotland and started creating the metal mailboxes around 1990, completing about 15 for Laguna residents; he still makes them occasionally. When working on his architectural metal projects, homeowners also needed mailboxes, so he began custom-making them to fit with the homes’ respective styles. It takes about two or three days to make one, welding together the pieces of sheet metal. He has two of these modern mailboxes on his own property on Canyon Acres Drive: One is a long rectangular box that rises at a slant from the ground. The other looks like a metal tube that appears to hang from a hook. Both are modern mailbox marvels. A sculpture-turned-mailbox-holder stands at least 4 feet tall on Crescent Bay Drive. Tucked along a curve on Crescent Bay Drive, a mailbox rests on the folded thumb of a redwood hand sculpture that stands at least 4 feet tall. The owner’s last name, believe it or not, is Hand. Longtime local Doug Hand, a 1960 alumnus of Laguna Beach High School, had the mailbox made about 20 years ago in the Monterey area. He was there for a conference and drove by a lot where wood carvings were being sold. One in particular caught his eye: A large carved hand with the index finger pointing out. 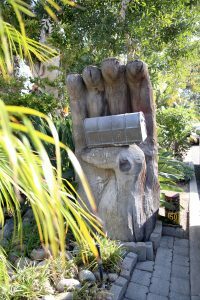 He thought it would be fun to place his home’s mailbox on the finger, but the man selling the carvings advised against it because the weight of the mailbox might make the finger break off. So, Hand paid for another one to be crafted with the thumb bent in toward the palm, providing a more stable base for the mailbox. He also had a wedding band carved onto the sculpture’s ‘ring finger’ to represent his own marriage. Hand and his wife, Diane, have lived in Laguna together for about 45 years—30 of them in their current home. Hand says he decided to embrace a more creative mailbox rather than something traditional because, well, “this is Laguna.” “I know there are a lot of artists in town. I’m not one of them, but I appreciate the eclecticness of the town,” he says. On Temple Hills Drive, a concrete structure houses the mail and decorative objects. Along the steep and curvy Temple Hills Drive, a corner home features a concrete-encased mailbox with a mosaic-type treatment. As owner Susan Immel explains, the old one on a wooden post kept getting hit by cars on the busy road, so she opted to create something more sturdy back in the early 1990s. 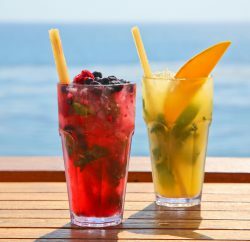 The project was finished within one day, using Quikrete. “I had to work fast because it sets up fast,” Immel says. Into the cement, she placed a variety of decorative pieces, some with special meaning. An artist, she painted a scene of Main Beach on a small porcelain disc pressed onto one side of the box. (Her ceramic painting talents can also be found on her front porch tiles, which feature a hummingbird, flowers and the like.) Also on the mailbox: a ceramic set of teeth, representing her daughter, who is a dentist; a gold mask reminiscent of “The Phantom of the Opera,” a musical that her husband likes; an old key; coins from her travels; as well as seashells, colored glass pebbles and a little image of a birdhouse because, well, she likes birdhouses. With such a unique mailbox, one would think it would be hard to miss. However, Immel says, trucks still manage to run into the concrete structure, leaving behind cracks. Yet, despite these impacts, it continues to stand, adding a bit of individuality to the neighborhood.